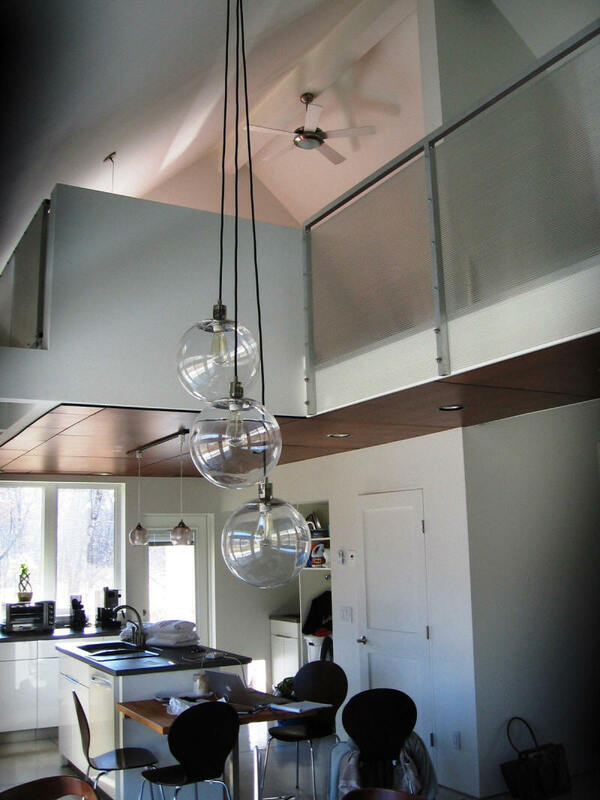 This is a modern, elegant sunspace design from Architect William Sikora. 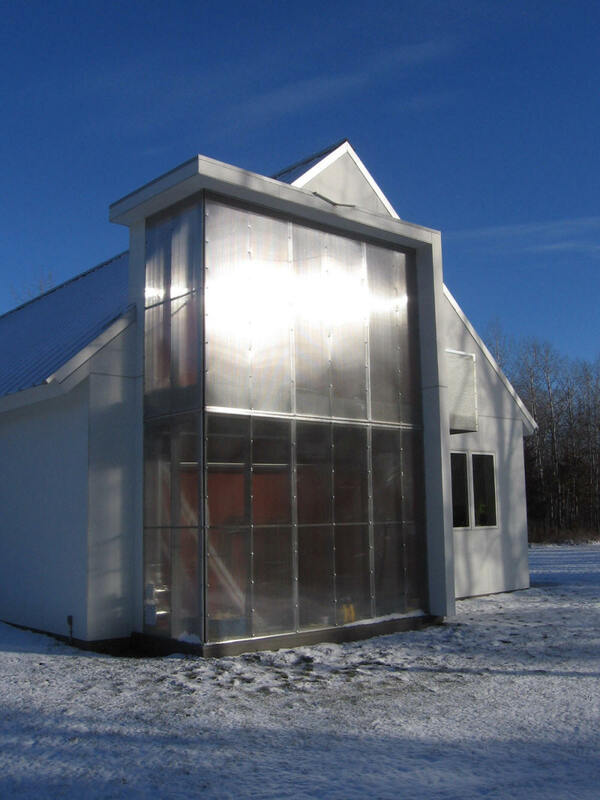 As with most low thermal mass sunspaces, it does a good job of providing heat to the house, but also serves other functions -- a true multi-purpose space. Thanks very much to William for providing the description! 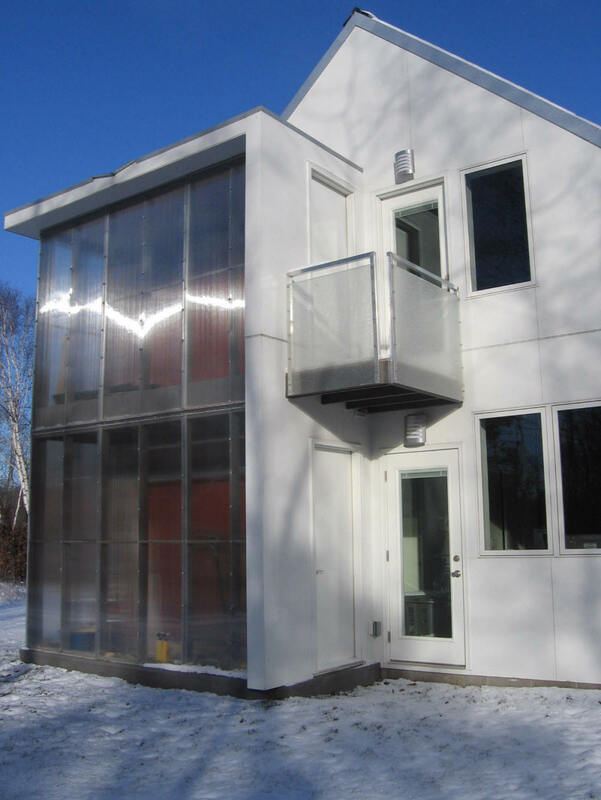 This family designed and built energy efficient home was constructed north of Minneapolis in 2010. It has an open plan with 900 sq ft of finished area on the main floor, a 400 sq ft open loft and attached 450 sq ft heated garage. Exterior walls are cement board clad rain screen vented through the roof and furred out with rigid insulation on the inside before drywall was applied. Exterior walls are R39 and the metal clad roof is R56. The main heat source is a sand bed heat storage system with an electric off peak boiler. No other heat sources are used. The design goal for this home was simplicity - as few moving parts as possible, nothing too high tech and everything must be built, serviceable and repairable by the owner with ordinary tools. 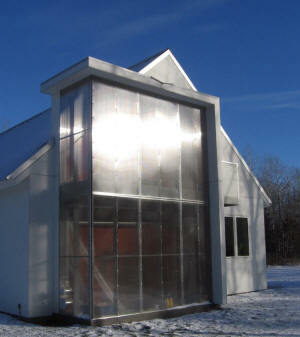 A two story low mass sun space is attached to the south side with both floors accessible. The upper floor can be used for sunbathing in Minnesota during a sunny winter day, clothes drying, wood drying or storage for items not affected by heat. Twin wall, 8mm polycarbonate was used for exterior glazing and interior and exterior railings. 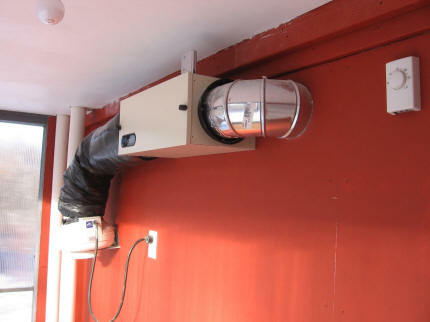 Heated, filtered air from the sunspace is blown into the loft of the home and pushed down with ceiling fans. Controls are simple – a line voltage cooling thermostat in the sunspace and a line voltage heating thermostat on the inside of the house. When both thermostats are closed, the 260 cfm blower starts. Cool air enters the sunspace from the house through a one way damper . Summer overheating is reduced by opening the upper and lower access doors. It is obvious that the sunspace is not perfectly mass-less as shown by interior temperatures after sunset at 4:30 PM. It can also be noted that the sun does not completely strike the sunspace until about 10:00 am due to trees on the south. The home’s heating system was not in use during these readings. Interior stagnation temperatures in the sunspace will reach 120 deg. with the blower off. Interior drywall and concrete floor provides enough of a thermal mass to prevent overheating in the house. As the sun gets higher and clears the trees to the south, the blower will run into the evening or as long as the home requires heat. It can be noted that 2011-2012 was a warm winter with 6,000 degree days rather than the average 8,000 days but it was also much cloudier.